Employees in these sectors have been asked to go on unpaid 'long leave' for two to three months, in addition to their standard 30 days of paid annual leave. "Six restaurants in our hotel has been closed. We have more than 550 rooms but only a few are occupied now. Most of our restaurant staff and others have been sent on long leave. It's in addition to the entitled annual leave. Some are sent on three months, others on four months of extra leave. But they won't pay for this additional leave. Although they assure us, we are not sure if will be called back to work or the hotel will extend the leave," said Leela, an employee of a five-star hotel. She is the breadwinner for her family back home in Sri Lanka and fears the new uncertainty in her job. "My annual leave will be due in another two months. If the situation continues it will affect me as well. Our salary is only QR 3000. I can't imagine being without a salary for three months,” she added. Sarah, another hotel employee working as a kitchen aide said, "initially the hotel management asked which of us wishes to go on six months unpaid leave, due to lack of guests. Then later they told some employees to take three months extra leave in addition to our annual leave. Many have been sent on at least two months of unpaid leave." "There are some materials in stock, but they’ll run out soon. It will take at least six months to bring materials from other countries and to find alternative routes. Some of our staff on annual leave have been asked to not return for a couple of months," according to a quantity surveyor at a construction company. "I'm given four months unpaid leave. My wife is not working so we can't manage if I'm not paid. I have two children studying here. So we decided to go home and enrol our children at schools there. I will come back if things return to normal and if my employer decides to keep me on the job,” said Satish, an Indian expatriate working for a shipping and clearance agent. 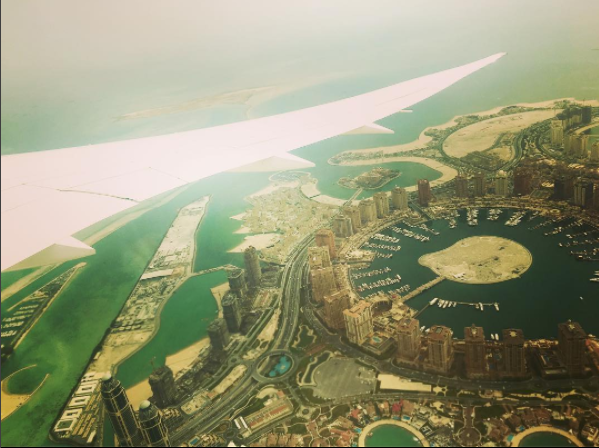 For lower-income expatriates working in Doha, the cost of living has risen. Nearly 80% of Qatar’s food imports come from neighboring Gulf states. Imports from outside the GCC usually cross the now closed land border with Saudi Arabia. Although food items have been brought in from other countries and via alternative routes, prices have gone up during the second month of the blockade. “Prices of vegetables, fruits, eggs, milk and meat have increased. Earlier, vegetables which we bought for between QR 3 and QR 6 are now more than QR 15. On some days, supermarkets sell vegetables and fruits for a lower price when they are well-stocked. Then prices increase again,” according to a homemaker. About 150 to 200 employees are now on ‘extended leave’ from the hotel. Many companies, including this hotel, have asked workers who had gone on summer vacation to not return on schedule and extend their leave by some weeks. On the question of end-of-service benefits, he said they have a guaranteed job to come back to, so no end-of-service benefits would be paid now. He added that he didn’t expect to see a recovery until well after summer, even if the blockade were to end soon.